It may be hard to believe, but it's been nearly two decades since the publication of Dark Matter: A Century of Speculative Fiction from the African Diaspora, which introduced readers to the fantastic worlds of speculative writers of African descent. Edited by Sheree R. Thomas, Dark Matter was a corrective against the massive oversight that had excluded African Americans from the official SF canon. While the giants of SF still cast a large shadow over the genre, black writers who were exercising their imaginative talents in SF/Fantasy from the 1920s to the present found a much needed space in the millennial anthology. A few years later, its sequel, Dark Matter: Reading the Bones (2005) was spawned. Like a dam bursting, other anthologies flooded the market—So Long Been Dreaming: Postcolonial Science Fiction and Fantasy (2004), Afrofuturism (2013), Octavia's Brood (2015), and so on—each expanding the scope of genre fiction written by writers of color, women, LGBTQ+, and others. These anthologies offered readers a chance to experience writers that went beyond the familiar names in the genre—Octavia Butler, Samuel Delany, Steven Barnes—and opened the field for new and emerging writers. The newest member of this canon, New Suns: Original Speculative Fiction by People of Color, takes its place alongside this group, broadening the margins even further with a collection of short stories by writers with unique visions to explore. 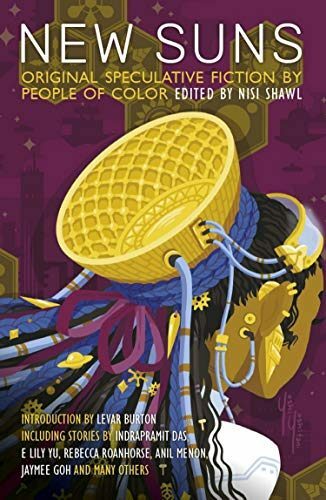 Edited by Nisi Shawl (Everfair ), who also writes the afterword (twinned with LeVar Burton's delightful foreword), the volume features seventeen original stories by writers such as Steven Barnes, Jaymee Goh, Karin Lowachee, Silvia Moreno-Garcia, Alex Jennings, and others. New Suns embraces diversity in more than name only. The breadth of stories featured here is quite stunning: they explore race, gender, sexual orientation, and culture; there is literally something here for everyone. Not all of the stories, however, are equal in strength and readers more interested in SF than fantasy might be disappointed with the dearth of relevant selections here. Yet, like most anthologies, all this comes down to personal taste, and Shawl has done an admirable job of curating stories that cover a broad overview of writers of color working in the genre. Like most anthologies of speculative fiction, then, the different sub-genres and themes that are explored here are as diverse as the anthology’s writers. On the surface, the result can be a bit disjointed, but each story tackles issues that are relevant to today's readers. In Tobias Bucknell's "The Galactic Tourist Industrial Complex," the first story in the anthology, the disruption caused to non-Western cultures by hyper-capitalism and tourism gets a satiric treatment. Tavi, a taxi driver in a New York City of the distant future, which has been invaded by aliens not through violence but tourism and gentrification, becomes embroiled in an intergalactic scandal. Tavi is soon caught between managing a diplomatic headache and trying to survive in a city that has reduced humans to capitalist fodder. Bucknell's humor is sharp, particularly in his observation of his analogous aliens as insensitive, colonizing tourists who treat Earth culture as an exotic plaything. In a smartly observed moment, a Galactic emissary tells Tavi how much of Earth is so "unspoiled, paradisiacal" and shows his appreciation for its unspoiled ecology by "... swimming with whales in the Pacific Ocean" (p. 24). Barnes's "Come Home to Atropos," on the other hand, takes this theme of cultural appropriation and twists it on its head. Parodying tourist promotional ads that lure elderly tourists to a Caribbean "paradise" where they can live out the rest of their lives, the story slowly reveals its aims, layering down its advertising tricks with hilarious accuracy and ending with a twist that isn't really a shock but a last hurrah. Post-apocalyptic or near-apocalyptic stories are also represented in the anthology, including Kathleen Alcalá's "Deer Dancer," Andrea Hairston's "Dumb House," and Lowachee's "Blood and Bells." Lowachee's story is the strongest of the set. In an apocalyptic future city worn down by violence, poverty, and classism—and in which gangs belonging to the Nine Nations control the grimy streets—a young woman in the Domani band must protect her late girlfriend's son, whom she helped raised, from his father, a member of the rival Opikei band that is rumored to be responsible for the mother's death. I suggested that this is the strongest entry in the anthology; but it is also its weakest for its abrupt happy ending. But that has more to do with how wonderfully expansive the world building in this story is. The short story medium simply doesn't do it justice. In a short span, Lowachee creates a world alive with its own social and moral codes that entrap those who live within them. Even its language, which the narrator speaks in first person—"Sometimes, Losa and me, we jawed about leaving the Nine Nations" [p. 157])—feels at once fresh, lived-in, and yet very distinct. Many of these stories feel as if they could stand to be much longer in fact. Hairston's "Dumb House" is a fun story about community, friendship, magic, and technology, told through the strong voice of its narrator—an old, black woman who has done and seen everything. However dissimilar it is in every other way to Lowachee's story, though, it too feels truncated, and the ending seems a bit tacked on. On the other hand. Alex Jennings’ evocation on memory and loss, "Unkind of Mercy," is compact, but incredibly effective. In this mysterious and haunting story, the nameless narrator sees shadow figures out of the periphery of her eye just as the people around her start to mysteriously disappear and become erased from memory. Another kind of loss is found in the hilarious "One Easy Trick," by Hiromi Goto, about a woman who literally loses her belly fat and attempts to lure it back. The loss of humanity, meanwhile, plays heavily in "Robots of Eden," Anil Menon's story, which takes place in India and explores the ways in which biotechnology and physical enhancements are reshaping what it means to be human. Menon takes familiar SF tropes and breathes new life into them. Citlal shouts, a piercing scream that assaults the vaults of heaven. The sound of skeletal women, dancing, fills the cold winter sky and the void beyond. "No," she says. "Better than anxious night than a certain path down your monstrous gullet. Better that we live and die by our own choices than at your whim. Better the night and all the cold stars than your hunger" (p. 120). The strength of women are prominent throughout many of these stories. I appreciate the way Shawl prioritizes women writers of color from different backgrounds, sexual orientations, and experiences, many of whom offer divergent perspectives of similar themes and cultures. Alcalá's "Deer Dancer" and Rebecca Roanhorse's "Harvest," for instance, both explore the motif of the deer dancer, a sacred legend in the native Yaqui culture, but each story handles it in fresh and imaginative ways. Reading them, alongside much of the rest of the anthology, offers a rich tapestry of cultures and values that reveal the diversity within similar cultures that are rarely explored in speculative fiction. If there is one overriding theme that runs throughout the anthology, it is the search of the marginalized for empowerment in worlds that limit their dreams and imaginations. Not all of the stories in this anthology might be equally powerful or appealing to everyone, but readers can appreciate the ways in which New Suns does more than offer a diverse group of writers of color from different backgrounds: it also offers a diversity of the futures that can be possible in the speculative canon. As Octavia E. Butler so succinctly puts it in the epigram that kicks off the volume: "There's nothing new under the sun, but there are new suns." New Suns is game in reminding readers of speculative fiction that the universe is full of many new suns waiting to be discovered. Cynthia C. Scott is a writer from the San Francisco Bay Area whose work has appeared in Glint Literary Journal, Copperfield Review, Flyleaf Journal, Graze Magazine, Strange Horizons. She also writes reviews for Bookbrowse.com. She's currently working on a series of SF novels called The Book of Dreams.